Corpus Christi Parish was established in 1958 by the Archbishop of Cincinnati, Karl J. Alter. The parish was entrusted to the care of the Franciscans of St. John the Baptist Province, Cincinnati, Ohio with Fr. Barnabas E. McAlarney OFM, named as the first pastor. The new parishioners were from Assumption Parish, Mt. Healthy; St. John’s, Dry Ridge; St. Ann’s, Groesbeck; and Our Lady of the Rosary, Greenhills. The Chapel of St. Francis Seminary (the former Franciscan seminary on Mill Road) was to be used for Masses until a new church building could be constructed. 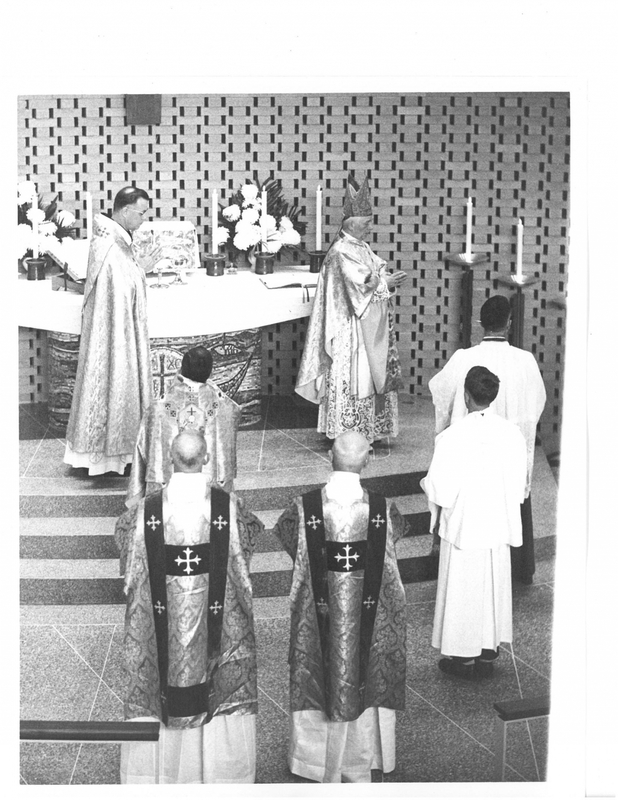 The first Corpus Christi Parish Masses at St. Francis were offered on Sunday, September 14, 1958. On Sunday, April 5, 1959, Fr. Barnabas announced that permission had been given for the building of a new church. The groundbreaking ceremony took place on September 27, 1959. This was a unique church — the first of its kind in the Cincinnati area. The Greek Cross plan had been chosen by the building committee. It would seat 482 in the nave and 160 in the balcony. The church would have a large Undercroft equipped with a kitchen. The altar was made of highly glazed mosaic topped with white marble. The tabernacle was made of bronze with enameled doors showing wheat for bread and grapes for wine. A beautiful crucifix hung in the center of the sanctuary, and on either sides were shrines to the Blessed Mother and St. Joseph holding the child — all hand carved by John Giglio. Stained glass windows on all sides of the Church building depicted scriptural and liturgical symbols: those on the East (above the altar), icons representing the Sacraments; those on the North, the Old Testament; those on the West (balcony), the Twelve Apostles; and those on the South, the New Testament. 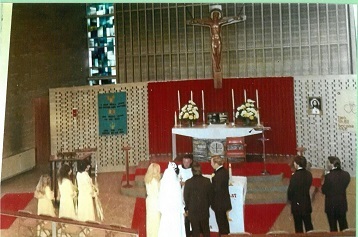 The Church building was dedicated on April 30, 1961. Ground was broken on the south side of the church for the Rectory on October 4, 1962. The completed Rectory was dedicated on April 17, 1963. The plan was for children to attend Grade School at the former Hamilton Catholic High School building until a permanent school could be built. Corpus Christi Grade School opened at this location September 12, 1966. Groundbreaking for the Convent (now the Parish Center) took place on October 21, 1965. The Sisters of St. Francis, Oldenburg, moved into the Convent August 12, 1966. Auxiliary Bishop Edward McCarthy blessed the Convent on November 10. Crowded offices, fewer Franciscan Sisters and increased enrollment in CCD religious education programs necessitated changes to the Convent and Rectory. In August, 1976, the Convent was converted into the Priests’ residence, Parish Offices, and classrooms. The Sisters moved into what was previously the Rectory. With the need for additional storage space, members of the Parish (with the leadership of the Men’s Society and Scout Troop 603) built the McAlarney Building in 1979, designating the West side room for the Boy Scouts' use. In late 1979, after consultation with two neighboring Parishes (St. Bartholomew and the newly formed St. John Neumann), it was decided that, rather than building a new school building for Corpus Christi Parish, a Consolidated School would be formed. St. Bartholomew Consolidated School began serving the three Parishes, beginning in the academic year 1980-81. 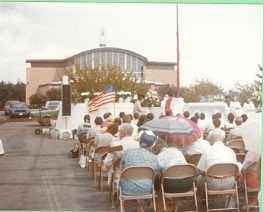 The Parish celebrated its Silver Jubilee celebration with an outdoor Mass on Sunday, September 11, 1983. The Theme was “Without U, Christ and I, There Would Be No – Corp-US Christ-I.” The Jubilee Mass was followed by many activities – a picnic, square dancing and movies. In the mid 1980's the church was a beneficiary of a substantial bequest which allowed the Parish to make several major capital improvements. These included air conditioning in the church, many needed repairs, a new roof, an updated cry room, storm windows, a new stove in the Undercroft, a transition from oil to gas heat, and blacktopping the parking lot. The Food Pantry began to operate in the mid-1980s in the lower level of the Parish Center. Previously volunteers of the Food Pantry distributed food to the needy out of their own homes. In March of 1994, the Franciscan Friars returned to reside in the original Rectory. This allowed the original Convent building to be completely converted to the Parish Center with a daily Chapel. Corpus Christi celebrated its 40th Anniversary on the Feast of St. Francis, October 4, 1998 with a Liturgy followed by a reception and a pictorial history of the Parish in the Undercroft. Once again, the church and buildings went through renovations: a new sound system, carpeting in the sanctuary, an upgraded sewage system, improving the terrain to allow for adequate water drainage, new lighting fixtures, and a large screen TV for catechetical and educational purposes. The cry room was equipped with a video camera and TV screen for easier viewing of the sanctuary. On July 1st of 2002 the Franciscans returned the administration of the Parish to the Archdiocese. Beginning in 2002, Corpus Christi and St. John Neumann Parishes were formed into a Pastoral Region, of working together in a spirit of collaboration. Our two Parishes also entered into a special relationship with St. John the Baptist Parish in Colerain Township, forming a Pastoral Area. Children from Corpus Christi and St. John Neumann began attending St. John the Baptist Pastoral Area School in the 2008-09 academic year. Also, a successful Summer Religious Education program for the three Parishes began, serving students and families who were not able to receive formal Religious education from the Pastoral Area School. Beginning on September 8, 2007 was a year-long celebration of the 50th Anniversary of the founding of Corpus Christi Parish. The year of Jubilee began with a special Liturgy. A 50th Anniversary Committee planned many celebrations and activities, both spiritual and social. The year-long celebration culminated with a Mass on September 14, 2008 with Archbishop Daniel E. Pilarczyk presiding. A wonderful dinner at Donauschwaben Hall ended prematurely when the high winds of Hurricane Ike caused one of many power outages (some lasting for several days in parts of Greater Cincinnati). 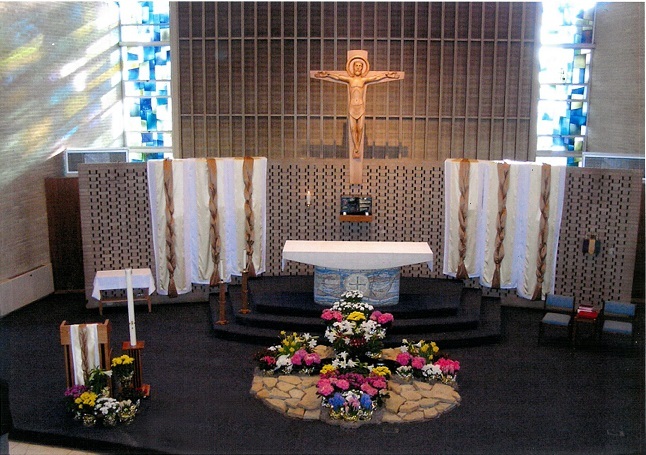 In 2009, Parishioners generously responded to a Capital Campaign entitled “Renew the Face of Corpus Christi.” On October 11, 2009, following the 10:30 a.m. Mass, ground was blessed and broken by the Parishioners for a renovation project to create a new Gathering Space, an elevator, new restrooms and a new Baptismal Font. The cabinets in the sacristy, usher area, and ambry were crafted by Jerry Armbruster, and a hand carved wooden sculpture (John the Baptist) and statue (Risen Christ) were each carved by Norb Hartmann. Several major capital improvements were made during the years 2011-2016. Mr. Robert Collins designed and crafted new Stained Glass windows for the Gathering Space (on both sides of the entrance door). 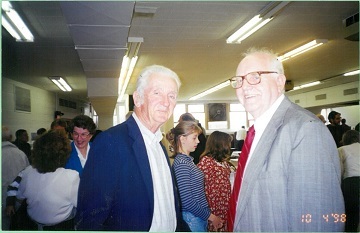 Mr. Collins was an apprentice in the stained glass craft in the 1960s, and his very first project was assisting in the stained glass window project at Corpus Christi in the early1960s. A generous donation enabled the restoration of the church bell. A very extensive renovation of the Undercroft was completed, and it was renamed Francis Hall. New air conditioning units were installed in the church. The Food Pantry, in the lower level of the Parish Center, was significantly expanded and remodeled. The exterior of the Church was painted, the parking lot and driveways were repaved, and updated phone and computer systems were installed (including internet connectivity across three buildings). In 2017, many significant changes to the Corpus Christi campus occurred. A very generous donation funded new lighting and a new engineered sound system in church. Many years of successful fundraising campaigns enabled the installation of a new boiler, conversion to LED lighting throughout the campus, and significant building repairs and computer upgrades. Corpus Christi continues to flourish!